The other day I posted about wanting to cook with beer. Well, I finally did it! I made some Bièroches, which are Cinnamon buns made with Unibroue beer (brioches à la cannelle). I spent around two hours working on them. Familiarizing myself with the recipe, getting the ingredients together, mixing ingredients together, and having no clue what I was doing. In the end, it turned out fairly well. 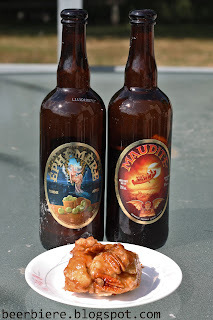 I used Unibroue's Maudite and Éphémère Pomme beers for this recipe, Maudite as part of the dough, and Éphémère Pomme for the glazing. The easiest part of the recipe was mixing the dry ingredients together, the hardest parts were waiting for the Pomme caramel sauce to reduce in the boiling process, and rolling the dough to make the cinnamon buns. In the end, the dough ended up clumping and sticking to my hands, so instead of it turning into cinnamon buns, they were more like cinnamon clumps, but they're known to me as Bièroches anyways! Also, for the most part, this recipe can be veganized, if you use a vegan margarine instead of butter. The recipe was influenced heavily thanks to Serious Eats and A Good Appetite Blog, but I edited it a bit, so feel free to have your own take on it. Mix together, beer will foam quite a bit, but that's normal. If dough is very sticky, add in some more flour, then sprinkle flour on a board and roll out the dough. Melt 4-5 tablespoons of butter or margarine (depending on your personal needs), brush butter across dough. Mix ingredients together will in its own bowl, should take about 5 minutes to mix. 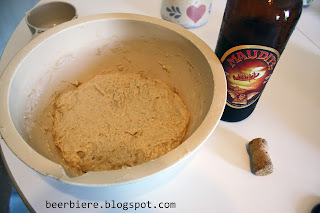 Spread the mixture across the dough as evenly as possible, don't be afraid to use your hands. Roll up the dough, and now next is the sauce! 2.75 (or 3) cups of Éphémère Pomme (Apple) beer, I think Cassis or Raspberry would work too. 1 cup of sugar - I found the sauce too sweet so maybe less, depending how much of a sweet tooth you are. Put the beer in a sauce pan for 45 minutes to an hour until it reduces to around 1 cup worth of mixture, then slowly add in sugar. Mix sugar and eventually it will bubble up quite a bit while caramelising, after a few minutes, let it cool, it should be ready. Cut up the Bièroche log into pieces. Pre-heat the oven to 350F (176C) Next, (OPTIONAL) add some pecans to the bottom of a brownie pan (or whatever pan you decide to use), if you decide on using pecans. Pour the caramelised Éphémère mixture to the bottom of the pan, there may be some mixture left over, that's okay - you can use that for ice cream topping or anything. Stick it in the oven, it should take 20-25 minutes approximately. Enjoy! I really enjoyed it. The dough had a bit of a zing to it that reminds me of Maudite quite well, but to most people, it's not really noticeable, but it really gives it an interesting flavour to the Bièroche (Cinnamon Buns). The caramelised Éphémère is subtle in the sauce, giving it a hint of apple deliciousness. I recommend doing this recipe with another person if possible, because you'll be spending two hours doing this, but in the end - everyone will want a piece of the Bièroche! 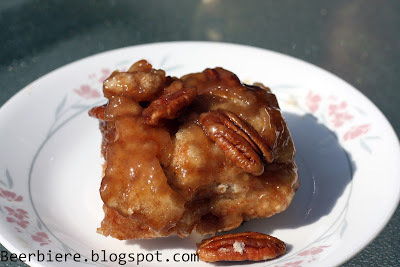 This is one of the better cinnamon buns I've ever had, and I'm usually hard on myself when I bake anything. For Thanksgiving, I was a bit tipsy, and decided to make bièroches again, they turned out amazing. Instead of Maudite, I used Trois Pistoles. 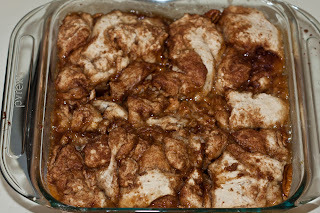 Also, for the glazing, I just used a mixture of butter and brown sugar instead of the beer caramel sauce to save time. Today, beer based cinnamon buns, tomorrow: mocha stout ice cream?! I'm sold! I'll definately be making this tomorrow. Can you explain a bit why you chose to use the beers you did? How do they complement the flavours? Also, if I can't find those ones, could you recommend substitutes? Thanks for the recipe, I'm excited to try it! 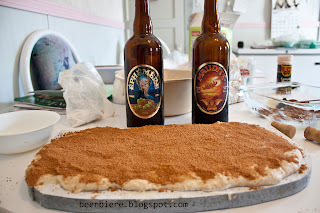 1) I had been brain storming for a long time, I thought to myself "I've always wanted to use a heavy Unibroue beer for a recipe" but couldn't think of anything. The darkness of the Unibroue Maudite gives it a bit of a nice colour to it, plus the beer is quite sweet and yeasty, so I knew that would work better in the cinnamon buns rather than a pale lager. You can actually taste a slight hint of the beer's maltiness in it, which is interesting. I chose the Apple beer as apple and cinnamon go hand and hand. However, the beer sauce needs some tinkering. When I tried the sauce on its own, I was kind of wary about it. BUT - on the cinnamon buns, it really worked, a slight apple taste added to the bun, overall. The beers are pretty widely available, but for alternatives - I recommend darker beers, but anything would work. I think Okanagan Spring's Brewmasters Black Lager would work really well, or else Phillip's longboat chocolate porter (a chocolate hint to the cinnamon bun would be epic). and any fruit beer for the caramelized sauce. I'm making this again today and this time I'm using Sap Sucker Maple Porter by Fernie Brewing Co. in the sauce. I've never tried it before but it seems like it should go well. Also, I got a big bottle, so I can sample at the same time!